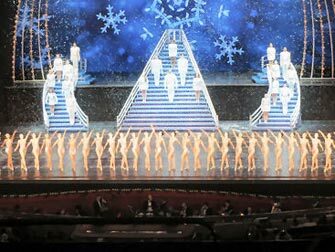 Radio City Christmas Spectacular is a magical Christmas show for the whole family, starring the Rockettes. The show, which premiered in 1933, has become a true New York Christmas tradition and going to a show is, well, spectacular! Save on Radio City Christmas Spectacular tickets by buying them before you go to New York. Online purchase of theatre tickets is safe, easy and, above all, saves you time and money! Would you like to receive an email as soon as the tickets are available? Send me a message at eric@newyork.com.au and I’ll email you on the day the tickets go on sale so you can place your order right away! The show is held in the Radio City Music Hall. The holiday season around Christmas is one of the most magical times to spend in New York City. The whole city is in a festive spirit: there are Christmas trees, the streets and shops are decorated and the ice skating rinks are busy. Radio City Music Hall is an enormous indoor theatre in New York and it is a theatre unlike any other. Once inside, you will marvel at its classic beauty, which is a New York City landmark. The Great Stage (65ft by 144ft) is considered by technical experts to be the most perfectly equipped worldwide and the shimmering gold stage curtain is the largest in the world. During the Christmas Spectacular you’ll be transported to a wonderful Christmas world full of magical Christmas stories, spectacular dance moves performed by the Rockettes and of course the ‘The Parade of the Wooden Soldiers’. For this act the Rockettes are dressed like wooden soldiers and fall over like dominoes during the performance. A special and unforgettable act! Of course, Santa Claus has to be present in a show like this. He tells the story of this magical show and makes sure that everyone is in the Christmas spirit. After the show, children can pose with the real Santa in the lobby. How to buy Radio City Christmas Spectacular Tickets? It is easy to buy tickets for Radio City Christmas Spectacular via the below link. I recommend buying tickets online, before your trip to New York. You will save time, money and most importantly, won’t have to stress about finding tickets when you’re in New York. A lot of shows are very popular and often sell out; I recommend booking your tickets through the below website. 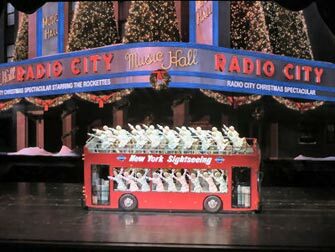 Eric’s Tip: Radio City Christmas Spectacular is a wonderful show, great for getting into the holiday mood. The show is suitable for young and old. The Radio City Christmas Spectacular is a little bit different each year. Even if you’ve been to the show once, it’s worthwhile going again!